Lisa Hayes is the founder of All in All Parties Sydney and has just branched out to Geelong VIC. She has been nominated for the 2014 AusMumprenuer Awards and below shares her intimate interview on life, motherhood and All in All Parties…..
Tell us about you and your family? We are a happy family of five. I am Scottish, my husband a Kiwi and we have three kids Brandon (7), Poppy (3) and Asher (4 months). Tell us about your business? We specialize in unique children’s pop up parties saving parents time, reducing stress levels and creating a party with a wow factor. What was the inspiration for your business? My kids always wanted themed parties but there were never enough hours in the day to source and create what was needed. Why did you start a home-based business? Doing something in my own time, in my own hours and spending time with my kids were all things that I really wanted. What has been your greatest challenge & how have you overcome this? I have had a few challenges along the way and have had to overcome them, stay motivated and to push through. All in All Parties first started out as All in All Party Boxes, selling full party packs in a box which included all tableware, games, prizes and lolly bags. I worked on the idea for a year before realizing there wasn’t a huge market for this and therefore had to rethink my ideas. It was difficult not to be precious to the original concept and admit to myself that the appetite just wasn’t there as I had expected. I brought on a business partner thinking this would make all the difference; two heads are better than one and all of that, but unfortunately the partnership didn’t work out as she didn’t have the time to spend on the business it needed. This was really hard as I was nine months pregnant and I had to re-focus and decide where I wanted the business to go. I thought about what people really wanted and All in All Parties was born! Changing my products, gaining and then losing a business partner really made me a stronger businesswoman. I am more motivated than I have ever been and have big plans, which include franchising down the line. What’s your best marketing advice? Always be true to yourself and to your brand. Build a brand so that it is recognizable in any circumstance and use social media such as Facebook, Instagram, Pinterest etc to gain followers and to allow people to get to know you. Word of mouth goes a long way so the more consistent you are the better feedback you will receive. Make sure you have a website from the ‘get-go‘ as it makes you look more professional and your business can come across bigger than it is. Advertising locally can make a huge difference and can really hone in on your target market. You can do this in print or using the ‘likes’ of Facebook. Bouncing your ideas off a third party is always helpful, and having a business plan is also a necessity as it is something you can uses as a reference to regain focus. Don’t forget you chose your business avenue for a reason, if you believe in your product and are passionate about your product it will come across in how you sell your product. What’s your best time management advice? Have a timetable and stick to it. Set yourself hours you are going to work, pop the kids in daycare and make sure everyone is on board with the timetable; hubby especially as you will need his support and backup when you are working. When you are working utilise the time you have by making a list of what you want to achieve by the end of the time allocated and you will have the satisfaction of ticking off the list (maybe that’s just me). Doing this makes it a business and not a hobby and if you wait until you have spare time you will never get anything done. What’s your best advice for creating a profitable business? Think Big!! Think in terms of scalability. It is important that your business isn’t dependent on you and you alone. There are only so many hours in your day so surround yourself with an amazing team who all believe in your product as much as you do to help grow your business. Have systems in place to allow the business to run at maximum capacity e.g. I have a driver that delivers my party goods to party locations for $100. Initially it might not make sense to pay someone to do something I could do, but in the long run it makes a huge difference as the business is less dependent on me (except my brains of course) and it allows the business to grow. What’s your best customer service advice? Use social media to show you are a real person; people like to see the person behind the brand. Get back to people quickly if they have a question/concern, especially during business hours. You wont be the only person they have reached out to that day, so the more efficient you are the more memorable you are. At the end of the day the customer is always right, but that doesn’t mean you should thoughtlessly be a ‘yes’ person. You know your product, so use your knowledge, experience and confidence to add that special something in the customer service stakes. I am always giving my customers advice on how best to run their parties e.g I had a customer just last week saying they were going to open presents as kids arrived. I strongly recommended they didn’t as the birthday girl might not want to share her new toys, or they might get lost or broken. The customer said you are absolutely right and went with my suggestion! Just because customers don’t ask doesn’t mean they don’t appreciate your advice. Just be you, at the end of the day you know your brand, you know your products and you know your customers. Have confidence in yourself and what you’re selling and customers will follow. What’s your best work life balance advice? Use your long term goals to prioritize the ‘here and now’… What is the most important thing to do right now. E.g. I was working, my kids were in daycare and my to do list was as long as your arm, but it was a special assembly at school where my son was performing. I was really stressed about the amount of work I had to do, how was I going to fit everything in! I took a deep breath and said “Lisa this is why you run a home based business, so you can be at the special things for the kids.” I put myself in the ‘here and now’ and did what was really important on that specific day. It is so easy to get bogged down with the ‘nitty-gritty’ but in reality all you need to do is keep looking at your long term goal and prioritization will seem easier. What have been your best achievements in the last twelve months? Setting up the business in Geelong. Having staff in Sydney who can set up the parties to free up my weekends to spend with my family. Getting to the stage where more than one party can be held on any one date. My biggest achievement would be turning my business into what it is today. When I was in hospital having my daughter (four months ago), I got an email from my then business partner saying she was opting out of the business. Instead of crumbling (thank goodness this was my 3rd baby otherwise I might have just crumbled) I rose to the challenge and really pushed the business to bring it to the level it is today. Why do you think you deserve to win this award? 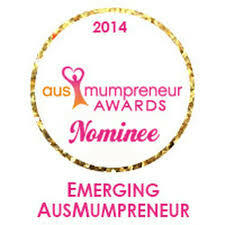 I would love to have the title of ‘Emerging Mumpreneur of the Year.’ It would be an amazing achievement! I definitely fall in the category of Mumpreneur more than entrepreneur because the more kids I have had, the more focused and driven I have become. When I had my first child I never considered running my own business. I loved my job in events in the ‘highflying’ world that is banking. When I had my second I thought that staying at home and being a mum was enough for me… that however was short lived as I came up with my business idea when my daughter was 10 months old. When my third, Asher, was born the business seemed to take off and now I have managed to get it to a stage where it doesn’t rely solely on me so I can spend time with the kids as well as doing something I love. I never seem to do things the easy way but that’s what makes my business a strong and successful one and I look forward to what the future holds. Gift Ideas for awesome teachers….